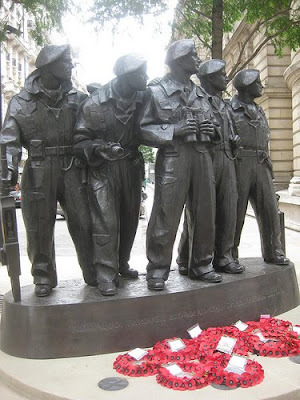 Located on the corner of Whitehall Court and Whitehall Place, in Westminster, the Royal Tank Regiment Memorial was unveiled by the Queen in June 2000. The sculpture was designed by Vivien Mallock, based on a miniature by George Henry Paulin. It depicts the crew of a Comet tank, used during the Second World War. A plaque explains that each crew consisted of five men - a commander, a loader, a gunner, a driver and a hull machine gun loader.